BONNEVILLE -- The number of sea lions at Bonneville Dam is below average and most are the larger Steller sea lions, not the California sea lions that have been showing up at the dam each spring to feast on salmon and steelhead. In fact, all of the observed predation between Dec. 8, 2018 and Jan. 31, 2019 on fish has been by steller sea lions and no observed predation has been by California sea lions, according to the first 2019 monthly pinniped status report released this year by the U.S. Army Corps of Engineers. 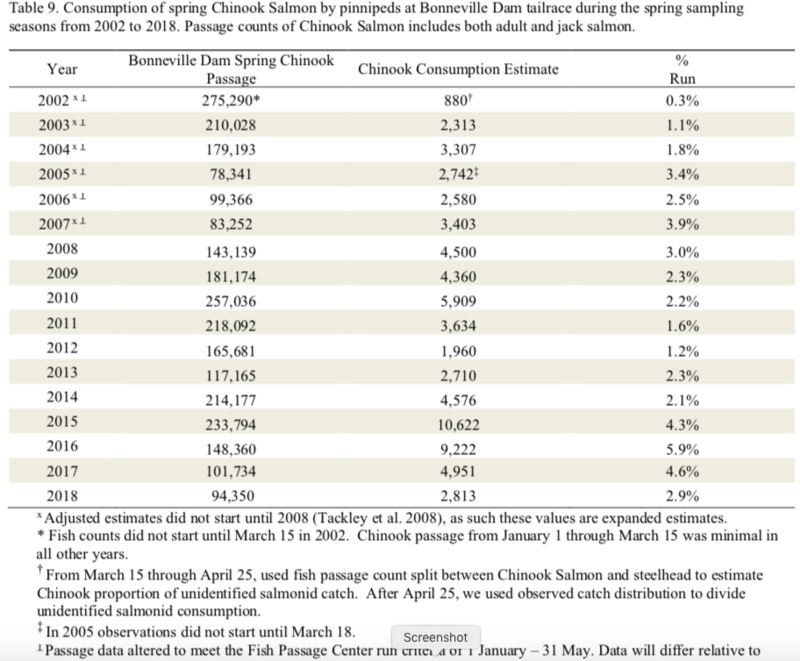 During this period, just one Chinook salmon, four coho salmon (in December), 11 steelhead and one white sturgeon were observed by the Corps being eaten by pinnipeds in the dam's tailrace, the report says, adding that these are raw numbers of actually observed predation which don't account for periods when observations were not being made. A spike in the number of coho salmon passing Bonneville Dam in December raised salmonid passage at the dam to above the 10-year average for the month, but January's passage of salmonids was below normal. Due to the in-season nature of this update, "the estimates provided here are the raw, unadjusted, and un-expanded estimates. Final (bounded) estimates will be provided after the season has completed and the data have been reviewed and analyzed," the report says. Also during the period Dec. 8 through Jan. 31, 11 "other" fish were taken. Those include: one small mouth bass, four chum salmon (listed as threatened under the federal Endangered Species Act), one walleye and five unidentified fish. A separate category "unidentified" added 13 more fish for a total predation of 43 fish. During spring 2018, the last sea lion departed from the dam June 2, 2018, but the first Steller sea lion arrived back at the dam July 14 and some number of the animals have been present at the dam ever since. The first California sea lion arrived Nov. 5. The study says that Steller sea lions arrived 14 days earlier than in the previous year and their numbers have been increasing at a greater rate. Steller sea lion average daily abundance during the study period was 7.9 animals (range of 2 to 24 animals), lower than the 10-year average during the month of January. The average daily abundance of California sea lions has been much lower, calculated by the Corps at 0.04 animals (range of 0 to 1), also lower than the 10-year average. No harbor seals have been seen at the dam since Jan. 24, 2018. Some 24 unique Steller sea lions have been identified. However, the Corps says the number of individually identifiable Stellers based on brands and unique markers is half that, at 12. "The number of individually identifiable pinnipeds is difficult to estimate due to the limited branding effort for the SSL," the report says. According to the Corps' final pinniped report for 2018, steelhead were hit hardest by Steller and California sea lions in the fall of 2017 and the spring of 2018, but most of that predation was by a rising number of Steller sea lions in the spring and fall. Some 7.2 percent of the steelhead run from January through May 2018 was taken by the predators and 6.8 percent of the winter steelhead run was taken November 2017 through March 2018 (pinnipeds took 11 percent of the steelhead run in 2009). 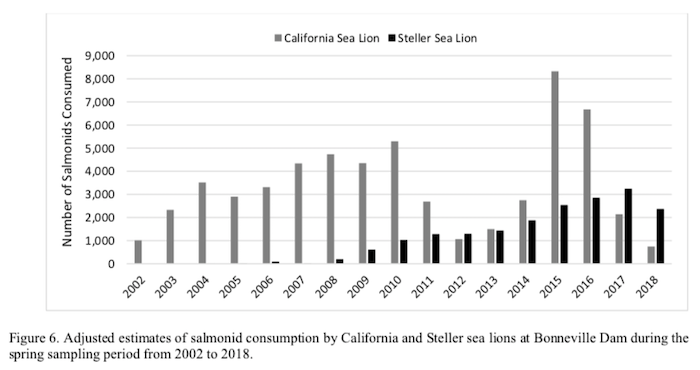 Of the winter and summer runs of steelhead, steller sea lions took 6.1 percent while California sea lions took 1.1 percent. Although the number of salmonids taken by pinnipeds during 2018 was lower than in 2017, the number lost was still near the 10-year average, the Corps report says. The number of Steller sea lions in the spring of 2018 was 4.7 percent higher than in 2017 and 4.8 percent higher than the 10-year average. The number of California sea lions dropped by 27.1 percent in 2018 from 2017 and by 23.9 percent of the 10-year average. "The near record low runs of ESA-listed winter and summer steelhead and small run of ESA-listed spring Chinook Salmon that passed Bonneville Dam this sampling season had to swim past high numbers of SSLs, however numbers of CSLs are slightly lower than past years," the 2018 annual report says. "Our estimates show that in general: CSL abundance and fish consumption are down, SSL abundance and fish consumption are up, and the total number of salmonids killed this year by both species of pinniped, although lower than previous years, is similar to the ten year average. "We documented increasing trends in white sturgeon predation that are of concern, and identified that ESA-listed winter steelhead are being impacted by prolonged SSL presence and predation," the annual report continued. Sea lions are protected under the federal Marine Mammal Protection Act. California sea lions in the U.S. are not listed as endangered or threatened under the federal Endangered Species Act. The most recent population estimate for the sea lions in the U.S. was 296,750 animals in 2016. Legislation that will allow the lethal removal of more California sea lions, as well as Steller sea lions, from the Columbia River was signed into law by President Trump in December. The Endangered Salmon and Fisheries Predation Act amends the existing Marine Mammal Protection Act of 1972 by giving more flexibility to remove sea lions that prey upon threatened and endangered salmon and steelhead in the Columbia River. The bill also lists white sturgeon as a protected species. Oregon, Washington, Idaho and CRITFC have said they will apply for a MMPA Sec. 120 permit to begin removing Steller sea lions at Bonneville Dam. In addition, a MMPA Sec. 120 permit was given to the Oregon Department of Fish and Wildlife last year to lethally remove up to 93 California sea lions from Willamette Falls on the Willamette River near Portland in order to protect from predation by the mammals the runs of wild winter Upper Willamette River steelhead and spring chinook. ODFW has lethally removed five California sea lions.